Strawberries are the tomatoes of spring. Recently, they’ve been sliced and diced, pickled and pureed, and added to more dishes than I can count. I realized that their color and texture and juice are great complements to vegetables, salads, and even poultry. And since we harvest over a quart of the most delicious (though seedy) Chandler strawberries from our CSA every week, I have the luxury of experimentation that comes from excess. I love excess when it allows me to be inventive, not to sweat wasting something precious if the experiment flops. 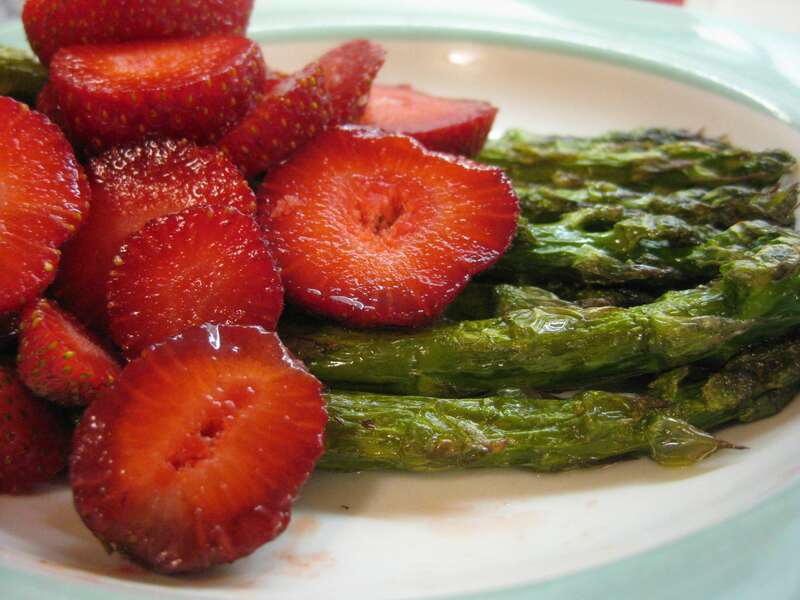 The idea of combining asparagus and strawberries came to me in a different field. I went to a local farm to pick strawberries (since I was making jam and needed more than my CSA allotment) and discovered that they had a second pick-you-own asparagus patch, remote from the one I have been frequenting since May. I couldn’t resist picking both, despite having a refrigerator full of asparagus stalks destined for soup. After a month or so of steamed or boiled asparagus, we turn to other methods such as sprinkling them with olive oil and salt and roasting at 400 or more degrees until slightly charred. To perk them up, on went sliced strawberries. A great contrast that perfectly reflecting the season. Roasting asparagus is good, but roasting it, then wrapping a stalk or two in a bit of prosciutto, sprinkling it with Parmesan, and then roasting for a few more minutes ’til the cheese melts is even better! Oh yes, love that too. I also like it with an egg as I posted a bit ago.